Melt butter in a large pot with banana on low heat – about 3-4 (My banana was mushy and frozen, so it kind of melted down with the butter nicely). When the butter and banana are melted down into a thicker liquid, add in the marshmallows/marshmallow flluff. Stir until all marshmallows are melted down and add vanilla & salt. Once all is mixed together, add in the cereal, about 2 cups at a time. Keep adding the cereal until you have a nice consistency – if it’s too runny, add a little extra cereal until the marshmallows have covered the rice crispies evenly. Remove the mixture from the pot and press into a 13×9 greased (i used butter to grease) glass pan. I wet my hands with water so that the mixture didn’t stick to my hands when molding the treats into the pan. 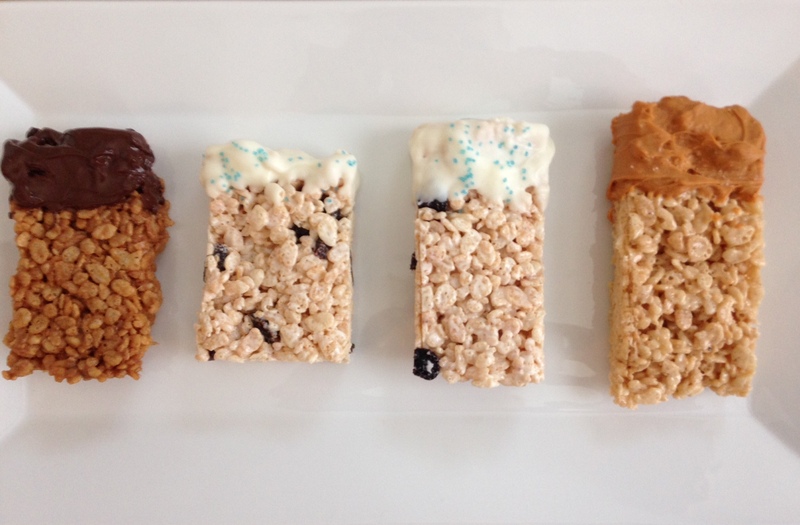 Place in fridge for 30-60 minutes, or until the rice crispy treats have hardened up. Once ready, take out of fridge and cut into desired pieces. Place on parchment paper. For the chocolate: put chocolate chips in a double broiler until melted down. 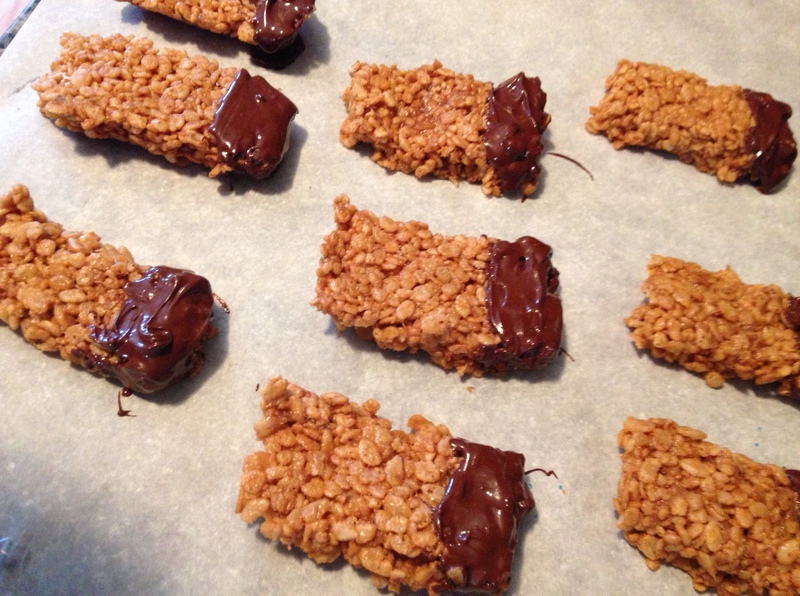 Dip rice crispy treats and cover with desired amount of chocolate. Place on parchment paper until chocolate has hardened (or put in fridge to harden chocolate faster). Serve with chocolate milk & Enjoy! My favorite is the caramel dipped with the salt. Thanks for sharing your treats! You make everything with love!